“If more of us talked about it, more women might say: ‘Hey, I’ve had those symptoms, let me go get checked,'” Mowry writes. 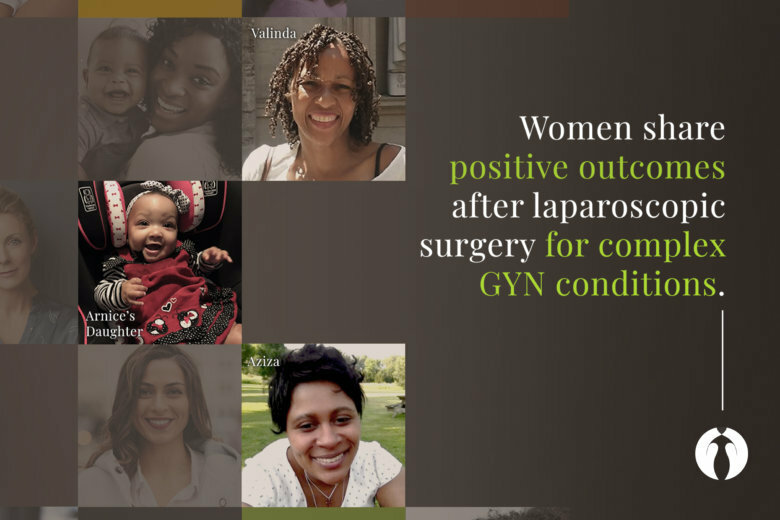 Aziza details her experience and results of laparoscopic fibroid removal at CIGC. At the end of January 2016, Aziza went for an ultrasound to figure out why she was having heavy periods. She was told that in her records, she had been diagnosed with fibroids five years prior during a visit to the hospital, however no one had ever mentioned that to her. In the five years since the trip to the ER, the fibroids initially detected had now grown substantially. Delaying treatment for fibroids can negatively affect fertility in some women, depending on size and where they are located. Aziza was given limited options for treatment and was faced with a hysterectomy. Knowing this would eliminate the possibility of pregnancy, she looked for other options. Many doctors recommend hysterectomy for fibroid removal because the surgery will eliminate future fibroids from growing. In many cases, doctors are not comfortable removing multiple or large fibroids from the uterus due to the risk of blood loss and the time required under anesthesia to remove them. When time passes, and fibroids grow, these risks increase. After disappointing results from trying changes to her diet that she had researched online, Aziza started looking for places that would offer a fertility saving myomectomy and found CIGC and Dr. Natalya Danilyants. For women with fibroids who are of childbearing age, and who want to maintain fertility, Dr. Danilyants is able to perform a LAAM® fibroid removal for fertility, a minimally invasive myomectomy that allows the patient to retain her uterus and recover quickly. With the help of minimally invasive techniques, Dr. Danilyants removed 25 fibroids and an ovarian cyst while still leaving fertility as an option for Aziza. Endometriosis had been preventing Arnice from getting pregnant for 23 years. For decades, Arnice suffered from painful menstrual cycles, and after her first daughter was born, she struggled to have another child. With her daughter now 24 years old, she had been trying for a second for years, unsuccessfully. After giving up on believing she could have another baby, her journey led her to CIGC. After her consultation with Dr. Paul MacKoul, he explained that she likely had endometriosis and possibly scar tissue from a previous C-section. Endometriosis is considered an invisible illness because it doesn’t show up on any diagnostic imaging, and often doctors misdiagnose the condition for years because it’s not well understood. From 13 to 38, Arnice suffered with endometriosis without a diagnosis. A GYN specialist was crucial in helping Arnice to identify and treat her endometriosis. Luckily, she was referred by her OBGYN — a decision that changed Arnice’s life. OBGYNs working in tandem with GYN specialists are the only way to ensure patients receive the best care and most advanced procedures available. Valinda Nwadike, MD, an OBGYN based in Southern Maryland, has been referring patients to Paul MacKoul, MD, and CIGC for over a decade. When it became clear she needed a specialist, she knew she wanted to come to CIGC. After suffering from symptoms such as heavy bleeding, anemia, and fatigue for a few years, Dr. Nwadike made the decision to have a hysterectomy. Dr. Nwadike met with Dr. Danilyants, co-founder of CIGC, who with Dr. MacKoul developed the DualPortGYN® technique. The CIGC laparoscopic hysterectomy is performed using DualPortGYN, a technique that uses two tiny 5mm incisions, one at the belly button and one at the bikini line. The incisions go through the midline, not muscle, so patients have less pain. Three different women with three different stories. By sharing their stories, together with the likes of Michelle Obama and others, they open the doors for other women to receive the diagnosis and treatment they need. Their experiences with CIGC are just a small representation of the difference minimally invasive techniques from a GYN specialist can make. The CIGC personalized and collaborative approach allows patients and partnering physicians to understand their options so that they can have confidence from the very start. The CIGC specialists have performed more than 20,000 GYN procedures and are constantly finding better ways to improve outcomes for patients. Learn more about complex GYN conditions from a GYN specialist at CIGC. Book a consultation today or call 888-787-4379.